Pv Contributor Christina Pushaw studied abroad in Russia and worked for an international education management company in Georgia and Azerbaijan. She has traveled extensively in Eastern Europe and conducted field research in Ukraine. 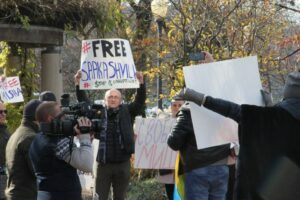 Recently, she organized a protest in Georgetown over the imprisonment of Ukrainian opposition leader Mikheil Saakashvili. PV sat down with Christina for a Newsmaker interview. Question No. 1. What is the central issue facing the Ukraine today at least as it relates to Mikheil Saakashvili? Christina Pushaw: The central issue facing Ukraine is corruption. In 2013-2014, the Revolution of Dignity (Euromaidan) drove out the previous corrupt government, but unfortunately, they were replaced by another corrupt government. Over the last four years, necessary reforms haven’t been instituted – despite the government claiming to be committed to reform (and getting funding from the USA to achieve it). You can imagine how frustrating it is that so many people died for a free Ukraine and the country hasn’t made real progress – in fact it’s probably gotten worse for many Ukrainians. How this relates to Saakashvili: He’s built a reputation as a real corruption fighter. When he was the President of Georgia, he and his team reformed the country, which was also a typical corrupt post-Soviet state (even a failed state) and transformed it in a matter of 4 or 5 years. But that’s a rough process politically – he fired all the police in the country, for instance, and set about rebuilding the force based on meritocracy. Imagine how politically unpopular that would be in the USA. 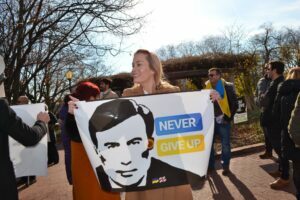 After Saakashvili was arrested on Friday, his wife, who is Dutch, said that his arrest resulted from his campaigning against corruption getting too close to the political elites in Ukraine. Ukraine is more or less an oligarchy, so that assessment appears to be accurate. Some people wonder why a Georgian, who was president of his home country, would want to lead Ukraine. Well, like the USA, Ukraine is a multi-ethnic country. Saakashvili can be just as Ukrainian as anyone else. He was born in the Soviet Union, like any other Ukrainian politician. He studied at Kyiv’s international relations school, with the current Ukrainian president. He completed his military service in Ukraine. He’s not a carpetbagger. Until a few months ago, when the government revoked his passport, he was a Ukrainian citizen. He chooses to live there in danger, when he could be a political asylee in the USA. So, I don’t doubt he wants the best for Ukraine, and he might be the only leader with the exact experience needed. Question No. 2. You spent time in Georgia and came to know him. What can you tell us about that experience? Christina Pushaw: I lived in Georgia for two years, and arrived at the time when Saakashvili was still president – he left office in 2013. The peaceful transfer of power I saw was and is extremely rare in post-Soviet countries. I have met Saakashvili a few times and he is devoid of pretense: He’s the same person on the podium or off. He’s not interested in personal material gain, which is refreshing for a politician, but especially in that part of the world. For context, he earned his law degree at Columbia, so he knows America well. He loves our country, but can make a greater impact in the former Soviet space. He is also relentless: his favorite speech is Winston Churchill’s “We will fight on the beaches.” That is what inspired me to help organize a protest today in Washington. Christina Pushaw moments after learning that Mikheil Saakashvili had been released from prison. Question No. 3. What reforms is Mikheil Saakashvili proposing and what are your thoughts on them? 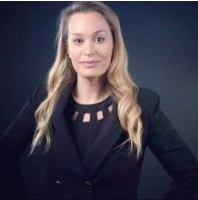 Christina Pushaw: His platform includes many reforms, but the most important have to do with rooting corruption out of the judiciary and – my personal interest – economic freedom. When Saakashvili was still President of Georgia in 2012, Donald Trump visited the country and met with him. A few days later, Trump went on Good Morning America and said that Georgia’s tax system, which is relatively low and flat, is what America should aspire to. I couldn’t agree more. I went to a conference in Kyiv a couple of months ago about economic freedom, and we had dinner with Saakashvili. Economists from all over the world met in Kyiv, because it’s ranked the least economically free country in Europe. The bureaucracy and regulatory burden invites corruption, and the status quo is entrenched. But many people truly desire a change, and he knows how to accomplish it. Question No. 4. Is the corruption in the Ukraine a function of left over oligarchs or a new bid by some to enrich themselves? Christina Pushaw: Corruption in Ukraine today is a mix of both phenomena. Some of the old elites were forced out in the 2014 revolution, but the system was never reformed from the Soviet era, so new elites can take advantage and prosper from public office. Moreover, there is not much of a difference between the old and new elites – to me, an oligarch is an oligarch. Replacing one oligarch with another isn’t revolutionary. The entire system needs to be overhauled for a real chance at fighting corruption. Getting rid of the Soviet legacy means transforming the judiciary, instituting meritocracy, reducing bureaucracy, and cutting unnecessary regulations that only benefit special interests. On the bright side, Ukraine has a relatively free press and strong civil society, so the people are motivated to accomplish that. Maybe not everyone wants reform, but, remember that every revolution in history has started with a small group of motivated people. Question No. 5. What can America do to help Ukraine reform? Christina Pushaw: First of all, we should be more careful about who we decide to support. It is not the responsibility of the United States to select “revolutionary” leaders in Ukraine and then pay them in increments, to become less corrupt. Actually, this is senseless and hurts the people of Ukraine the most, by giving a lifeline and legitimacy to those who don’t have the best interests of the country in mind. Obama’s team, with Biden as the point person, played a key role in constructing these unfortunate conditions after the revolution. Ukrainians are more than capable of choosing their own leaders – while oligarchs have outsized resources, there are many ethical and patriotic people in the country. The greatest impact in terms of financial support from the West would be grants to independent civil society or media that attempt to investigate, expose, and address corruption. Basically, if we send financial aid to Ukraine, it needs to be more conditional, accountable, and transparent. Earlier this year I arranged a meeting with Mr. Saakashvili for my graduate school classmates who were visiting Ukraine on a research trip. Connect with Christina Pushaw at the sites below.